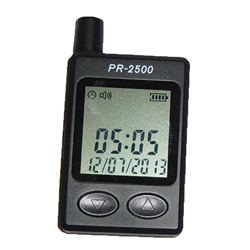 The PR-2500 is pocket-sized receiver that is compatible with all of our 2500 series transmitters. It is capable of receiving and storing alert signals from up to 4 zones. Each zone can store up to 400 events with a date/time stamp. In addition, each zone can store up to 999 events without the date/time stamp. With the counter function you will know when the monitor was activated. The rechargeable Li-Ion battery will hold a charge for up to 10 days. In addition to the LCD display, the PR-2500 will also give an audible tone for each of the four zones and a vibrate alert for times when you need it to be silent.